Many of our customers choose to convey thanks to clergy and other members of the ministry team not during the month of October (traditionally set aside as Pastor Appreciation Month) but instead at the end of year, often coinciding with Christmas. Whether you’d like to say thank you as an individual, as a family, or as a congregation – we’ve got plenty of unique designs from which to choose. 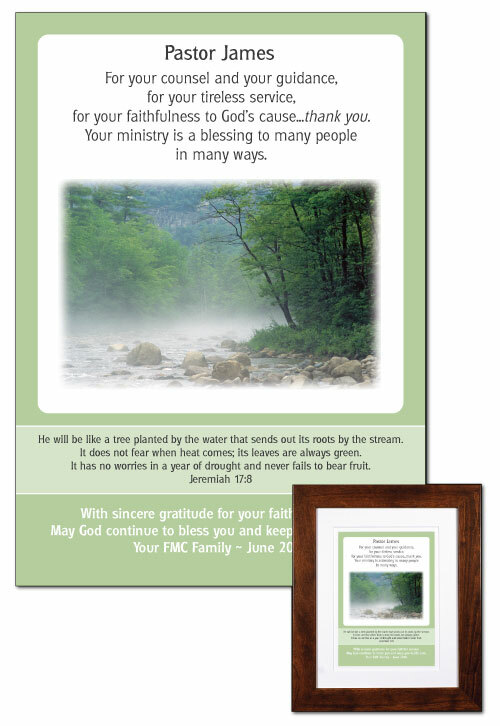 Each one of our plaques is personalized, so you can make it a truly one-of-a-kind gift for pastor or priest. Best yet……….it’s only October so if you’re going to do this for Christmas, you’ve got plenty of time to choose! We use only premium museum-quality materials to create our art. The paper, inks, matboard, and mounting tape – they’re all archival. What does that mean? The matboard will not yellow, and the colors in the artwork will not fade. Your plaque will look just as good years from now as it does the day you give it.